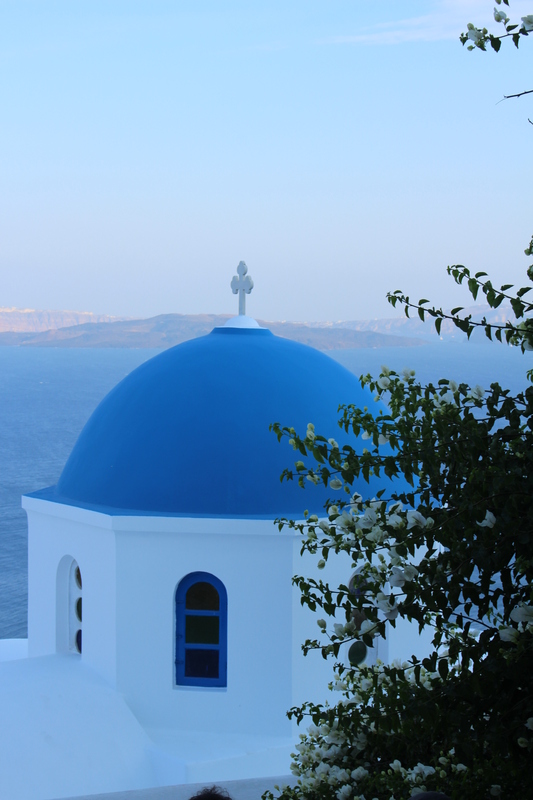 Just as one does not explore Santorini without a set of four wheels, neither does one depart from such paradise without witnessing their famous sunset. 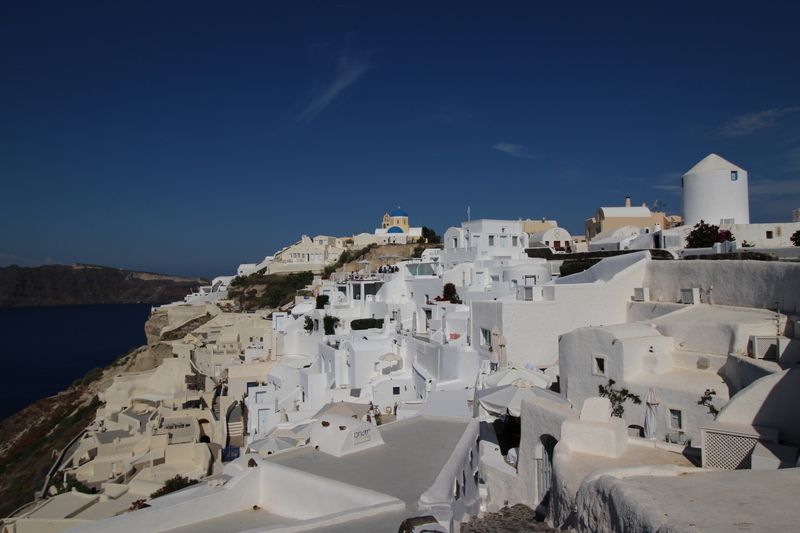 Santorini conjures up images of cliff perched towns, tiered along the rugged volcanic landscape that cascade down to the cerulean Agean Sea. 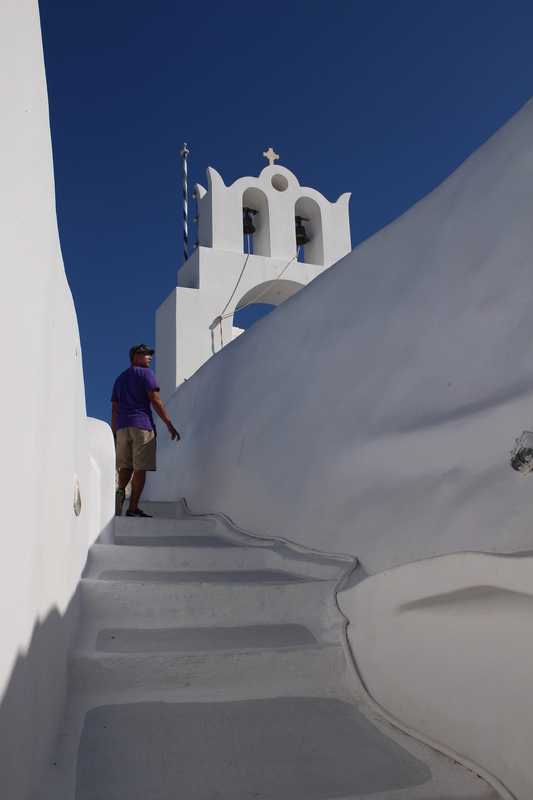 After a day of touring black sand beaches, lone churches, and panoramic views, there was more to be explored on day two. 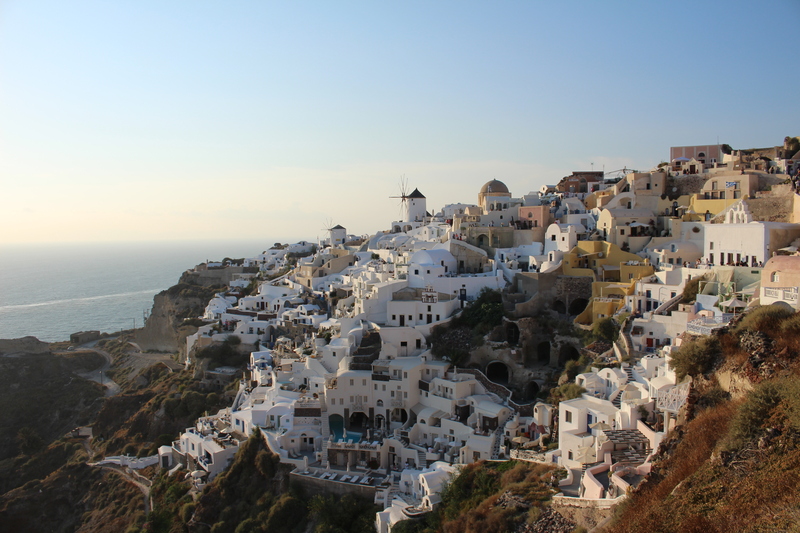 At the charming town of Oia, we discovered paradise yet again. 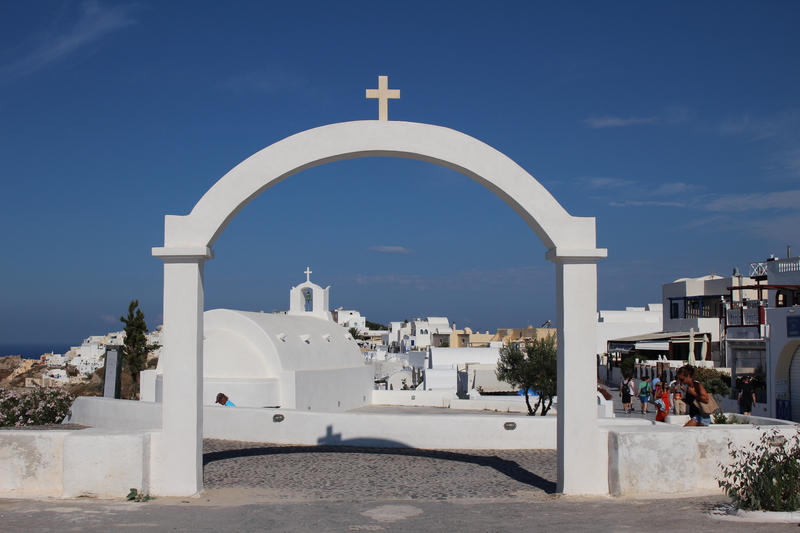 Their famed white buildings provided a stark contrast to the bronzed bodies of colorfully dressed tourists. 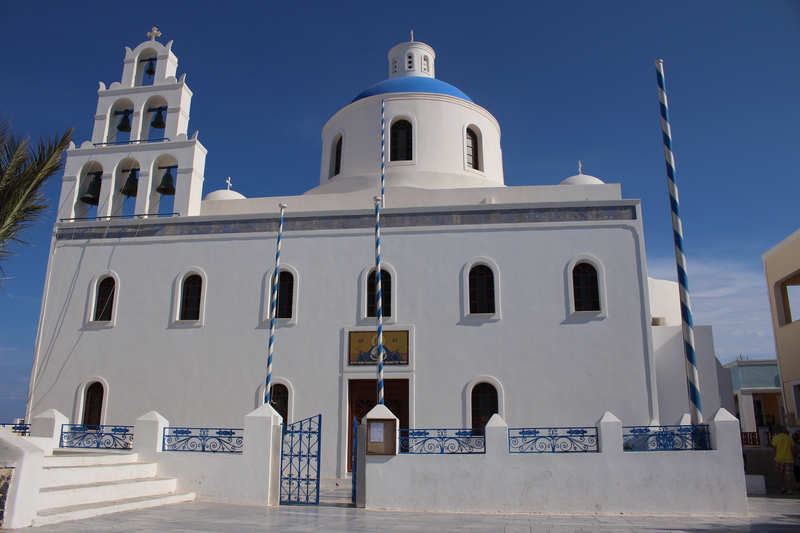 The glossy blue cupolas almost disappeared into the clear blue sky. Luxury enveloped us as if we stepped into an issue of a travel and leisure magazine. Shopping alleys with marble floors, lined with posh jewelry storefronts alongside tawdry souvenir shops – this was a place to spend the extra money we didn’t have. Narrow pathways between the buildings made it easy for us to stray away from the main tourist thoroughfare. We ogled at private resorts replete with aqua blue swimming pools, peered through small gates with steps leading down to something exclusive, and passed by closed doors to private residences of the well-to-do. At least, that’s what I surmised. The white walls are just as pristine up close as they are from a distance. I was afraid our fingerprints would sully their immaculate condition. They reflected the sun’s rays tenfold – it’s no wonder Simon developed a farmer’s tan so fast. 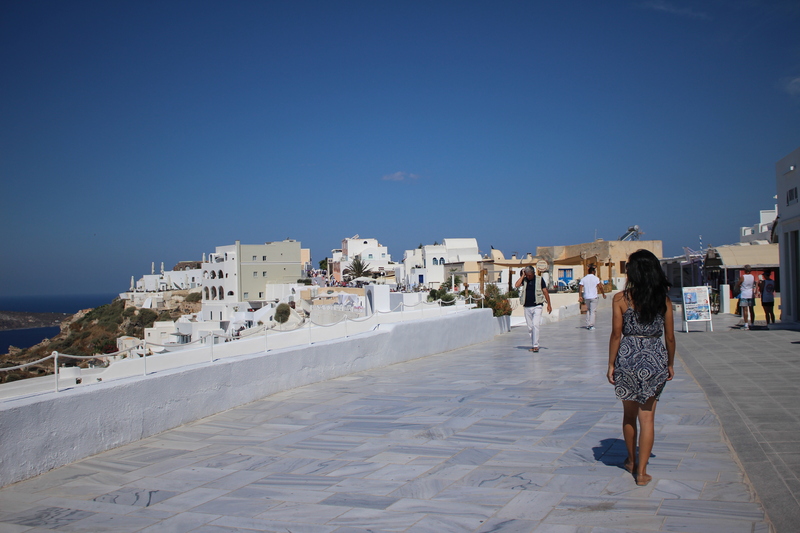 We escaped the midday heat by hitting the open road, only to return to Oia in the evening. The sky was quickly turning into a faded blue and casting long shadows in the passageways. We threaded our way to the western most point of the town, going with the flow of the crowd. It seemed like everyone and their Mama Mia were headed to the same place. It was an hour before sunset, yet every balcony, ledge, and step was already teeming with eagerly waiting observers, packed in tight shoulder to shoulder, a blur of faces and bodies cast in the remaining golden ochre rays of the sun. Luckily, we found a spot out on the unofficial lookout point: a rough patch of unfinished cement and brick that was built way past what was supposed to be the farthest observation point. Without any walls or barriers, I became queasy as my fear of heights settled in while others around me let their legs dangle freely over the edge. Normally baking hot during the day, with the reflection of the white walls compounding the brightness and heat, the slipping of the sun’s rays cooled off the town. The summer oasis quickly transformed into a cold windstorm that we did not expect. The wind whipped around us while loose strands of hair from my ponytail lashed at my face. Tee shirts billowed while short skirts and dresses weren’t spared, including mine. Doused in a perpetual wind bath, the constant howl of it filled our eardrums until it overflowed. Sometimes there was an unexpected lull and suddenly everything would fall eerily silent as if the Greek Gods pressed pause on this gorgeous scene so that we could enjoy it longer. Although I was miserably cold, and considerably uncomfortable with my almost bare bottom sitting on the rough concrete, there was no way I would miss this. Even without the sun setting just yet, the view right before me of the staggered white buildings clustered together in a maze of paths and stairs glowing under the fading light was magical. We stared at the sun until our eyes hurt. As we patiently waited, the yellow egg yolk color of the sun slowly started descending. At first it was unnoticeable, but towards the very end as soon as the perfect circle became a dome, it slipped away rather quickly, and then it was gone. An isolated “Woot!” came from the crowd, then another, and a cheer, and then finally a round of applause. I gleefully chimed in, clapping it up for Mother Nature’s magnificent display of splendour. Simon just looked at me with a silly smirk, making fun of me and everyone else who was giving a standing ovation to this natural phenomena. Sunsets happen every day, this is true. 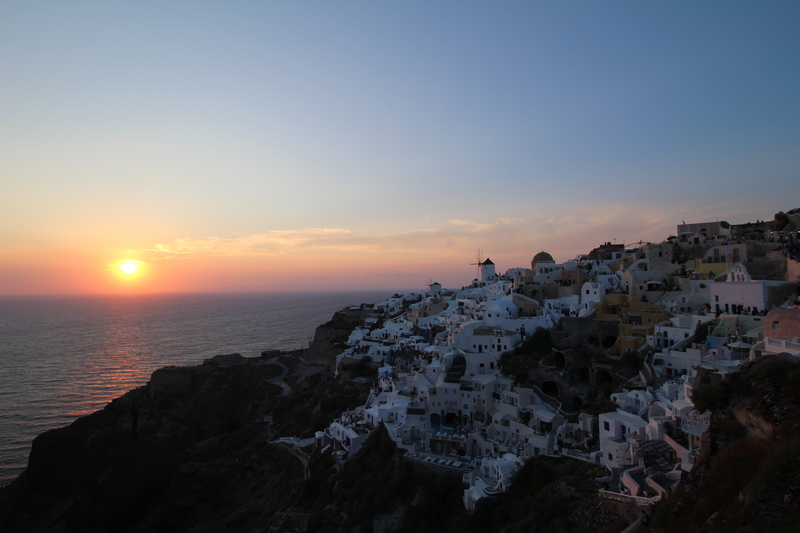 But this will probably the only time I will see the sunset from Santorini, and it was the most beautiful yet. Beautiful! Makes me wanna go back there…and with a real camera!